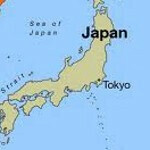 The Japanese market hasn't taken to the green robot like the U.S. has. Still, thanks to the Samsung Galaxy S, the number of Android users in Japan surged from 435,000 in June of last year to 2.2 million at the end of the year. But according to figures from comScore, during the same time period of 6 months, Japanese Apple iPhone users rose from 2.56 million to 3.79 million. So Android closed the gap with the iPhone by approximately 540,000 users in the last 6 months of last year. Don't let the statistics mislead you. The Apple iPhone only recently made it into Japan's top 5 cellphones. Traditionally, the country has favored featurephones. 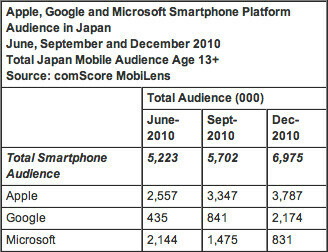 Even though the number of smartphone users in Japan grew at a blistering 33.5% rate over the last quarter of 2010, that brought the number of Japanese smartphone users up to only 6.9% which means that there is plenty of room for both platforms to make some ground in 2011. With Apple in 5th place in Japan, the top cellphone manufacturer is Sharp with an 18.8% share of the market. Panasonic (16.6%) is second and third is Fujitsu with a 15.1% slice of the pie. Kyocera is fourth with 12.7%, followed by Apple and its 12.2% share. Your post makes no sense. Why would jealousy come into play? It's the fact that Phonearena is being biased with their posts by adding their own witty remarks relating to android. What does it matter?, Android is still better than iOS. Not to mention the iPhone was released earlier than any android devices in Japan. Iphone4 already sold out 15 million so will wait and see iphone5 and I think samsung afraid that's why they relase galaxy s2 now cuz they knows that can't compete with next iphone5 in June or July this year and already LG kills galaxy s2 with LG optuimos 3D! Eventually, android devices will have a bigger market share in Japan, considering that android os in on multiple devices in multiple categories and price ranges. But the iphone will still dominate the high end smartphone class. looks like the new smartphone users went with iOS and the WinMo crowd switched to android. The android numbers Dec 2010 look a lot like the WinMo numbers from Jun 2010.